Summary Two drive RAID 1 Marvell Kirkwood NAS with iSCSI, backup to/from rsync targets and CIFS shares, secure remote access and media services. Iomega has been slowly improving its consumer NAS offerings, adding features and boosting performance. This time, it's the dual-drive ix2 that gets a facelift. The last time, remote access "cloud" features were added to the ix2-200 [reviewed], resulting in the ix2-200 "Cloud Edition" (CE). The ix2-200 CE didn't have any hardware changes, so we didn't review it. 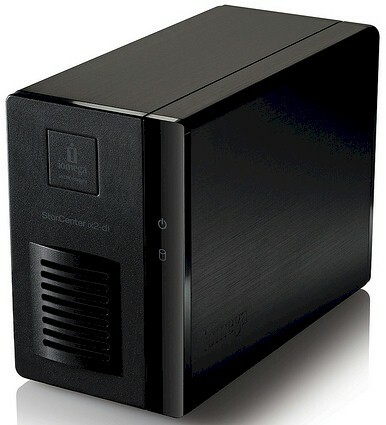 But we took at look at the CE features when Craig reviewed the single-drive Home Media Network Hard Drive - Cloud Edition over on SmallCloudBuilder. This latest change drops both the "Cloud Edition" and "-200" from the ix2's moniker, leaving it as just the plain ol' StorCenter ix2. This new beastie comes in 2, 4 and 6 TB versions populated with two 1, 2 and 3 TB drives, respectively. There is also a diskless version—the ix2-dl (model # 35887)—that Iomega sent for review, so that we could get the whole experience of installing drives from scratch. The ix2 has all-metal construction except for the slip-off front and screwed-on rear covers and no-fasteners-required hard drive frames. Front panel indicators are minimal as shown in Figure 1. You can see the small main board when you install the drives. But for a good look, I had to disassemble the ix2 to take the photo below. Table 1 summarizes the key component information and compares it to previous-generation ix2's. RAM and flash sizes remain unchanged from the -200. The main change is a somewhat beefier processor. I'm told the new processor is the same as a Marvell 88F6282 Kirkwood. It seems that Marvell is playing around with part numbers to help keep product teardown fans guessing. Iomega supplied two Seagate Barracuda 7200.14 2 TB (ST2000DM001) drives for installation and test with the ix2-dl. With the drives installed and spun up, I measured 20W of power draw. This dropped to only 7W when the drive spindown power save kicked in. I rated noise level as medium-high, with drive motor hum and head thunks echoing around and seemingly amplified by the aluminum enclosure. I could definitely hear the ix2-dl running in my quiet home office.